As a car buying consultant folks pay me to do the shopping because they often don’t have the time, patience, or the confidence to do it themselves. Everyday, I interact with all kinds of dealers throughout the country and have noticed some patterns between the good ones and the bad ones. Which doesn’t mean if every dealer does these sort of things, they’re out to swindle you. That’s definitely not the case. But they do provide insight on the sales philosophy of that particular store. How a dealership markets itself is a big indicator on how they would handle you as a customer. Whenever you encounter a dealer ad on television, hear it on the radio, or see it in print, pay attention to the objective of that ad. Is it meant to inform you about the dealership, or is the goal to lure you into the showroom by making promises that sound too good to be true? Guaranteed a minimum $6000 for your trade! Pick any car only $99 month! Bad credit, no problem... we can approve you today! Chances are the dealership prefers customers that are easy targets for bait-and-switch tactics, or can be easily fooled by markups and add-ons. 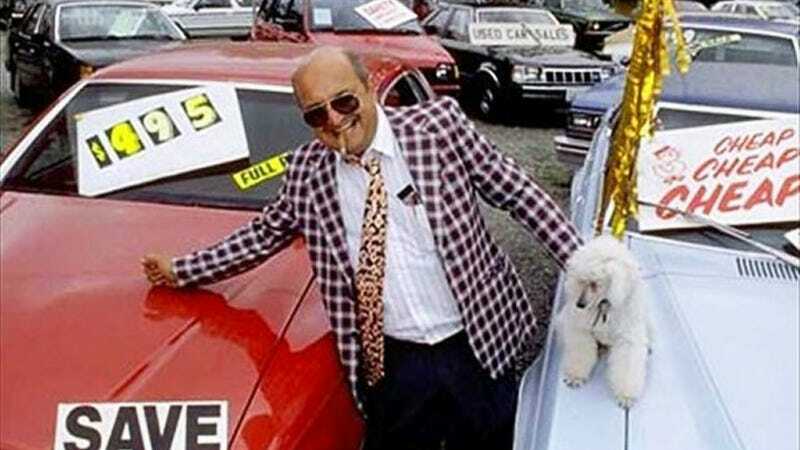 A lot of dealer ads are cheesy and stupid, but just because a commercial is a bit corny ,doesn’t mean that particular dealership is a bad place to buy a car. If a large percentage of the ad is fast-talk and fine print, however, you may be better off elsewhere. No matter how good of a deal you provide, or how many happy customers leave satisfied, there are going to be people who complain. It’s a fact of life and capitalism. So online reviews should be taken with a grain of salt. A dealer with four or five stars isn’t automatically a safe bet, though there is a good chance that a dealer with a one star rating probably deserved it. Which is why it is important to pay attention to the details of the complaints in addition to the frequency of negative reviews. Our man Doug recently talked about customers who complain about being low-balled on their trade, and while this sort of thing does happen, it’s not the worst offense. On the other hand, if buyers are complaining about shady contracts, damaged vehicles, or anything that just seems illegal, it is probably best to avoid that store. Pay attention to the sort of complaint as well, and see if the reviews are service or sales related. Sometimes one department can be great, but the other can be a nightmare. A good place to buy your next car might not the the best place to service it. Third party sites like Autotrader and Cars.com, in addition to Yelp, Google, and DealerRater all provide user generated reviews of various dealerships. Another site to explore is the Better Business Bureau. While the BBB might not have the leverage over dealerships that consumers would want, you can find out how many complaints customers have submitted for a given dealer. Another tactic is to search the web for a dealer that pops up in the news. If that store has been, or is currently being investigated by the authorities, or is the defendant in a large lawsuit that alleges consumer fraud, it’s probably not worth the risk. Just remember that some of these local news outlets tend to be a little sensational, and don’t always get the whole story. We’ve already established that if you’re looking to buy your next vehicle from a dealership, do most of your shopping on the phone or by email, though a combination of both is usually the most effective. Some dealers have refused to accept that an “internet sale” means you actually need to give pricing information via email. If by the third email message the dealer won’t commit to any hard numbers, just move on. Sometimes you can get a feel for the dealership just based on their website. In the image above you can see a Hyundai dealer that has gotten a bit ridiculous with their pricing. Instead of posting an MSRP (or Manufacturer’s Suggested Retail Price) like everyone else, this dealer has a “DPP” which stands for “dealer posted pricing.” It really means “dumb people pricing.” Basically what happens is that they markup a car way, way above its original price with all kinds of garbage, and then roll in rebates that most buyers would not qualify for. Dealer Posted Price (DPP) includes: College Grad Rebate of $900 Military Rebate of $500 Final Pay of $6,500 Environmental Protection Package Fabric & Paint Sealant of $995 Phantom Footprint Theft Deterrent Labeling System with Benefits of $1,300 Total Protection Plus Unlimited Tire & Wheel Unlimited Dent & Ding Key & Remote Replacement Windshield Repair of $1700. A “Phantom Footprint Theft Deterrent Labeling System?? ?” I gotta have that, clearly. I actually love it when a dealer pulls this sort of garbage on their webpage, because it saves me a phone call. The reason the Hyundai dealer in the example above operates this way is because they are located in a small town in South Jersey and the next closest dealer is about an hour away . Most smart shoppers would take the drive, but you would be surprised how many car buyers don’t want to travel at all to find a deal. If a dealer is the only game in town, and/or they’re situated in an area that primarily serves a lower income population, the sales staff may get in the habit of taking advantage of buyers that aren’t well informed. Of course, there are several dealers that are situated outside of a major city – or just happen to be in a less affluent part of town – that will be aggressive on price, and provide good customer service in order to remain competitive. In isolation the above clues don’t necessary mean the place is a “stealership,” but given the alternatives, you should probably focus on the stores without the red flags. Your time and energy is valuable. You’ve spent hours doing research on the vehicle you are going to buy or lease; spend a little time investigating the places you may do business with. If you have a question, a tip, or something you would like to share about car-buying, drop me a line at AutomatchConsulting@gmail.com and be sure to include your Kinja handle.